Poor Paisiello. Out of the nearly 100 operas written by this industrious composer just one was generally regarded as a masterpiece. Yet a few months before his death in 1816 at age 76 a young upstart from Pesaro premiered a competing version that would forever eclipse Paisiello’s. However, his Il Barbiere di Siviglia has never been completely forgotten and On Site Opera’s winningly effervescent revival which opened Tuesday night proved a delight. For several seasons On Site’s mission has been to present rarely seen operas in unconventional venues; last year Rameau’s piquant Pygmalion invaded Madame Tussauds Wax Attraction. 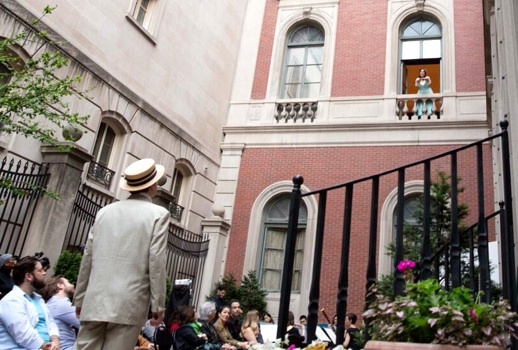 Barbiere’s first act took place in the courtyard outside the early 20th century Fabbri Mansion on East 95th street, which now usually serves as an Episcopal retreat house. Before a seated audience of 80 or so, a tiny orchestra of eight accompanied Almaviva and Figaro as they concocted their scheme to meet the cloistered Rosina who occasionally appeared at a second story window. Everyone then trudged up a long stone staircase to the mansion’s sumptuous library which became Bartolo’s home for the remaining three acts. The appealing staging by OnSite’s General and Artistic Director Eric Einhorn was pleasingly restrained: despite the often farcical complications, Paisiello and Petrosellini’s characters behaved like human beings rather than cartoon characters. However, Einhorn’s decision to mount the two-hour work without intermission seemed unwise. His nimble cast enthusiastically responded with energetic yet nuanced portrayals. Debonair in his spats and straw hat, David Blalock’s determined Almaviva clearly relished his loony disguises while Monica Yunus’s touching Rosina more than once displayed the sadness and humiliation caused by years of Bartolo’s suffocating guardianship. Figaro is a far less dominant figure than in Rossini’s opera—he disappears for most of the second and third acts—but Andrew Wilkowske’s bustling barber parried wittily with the brusquely domineering Bartolo of Rob Nelman, frightening in his florid mutton chop sideburns. 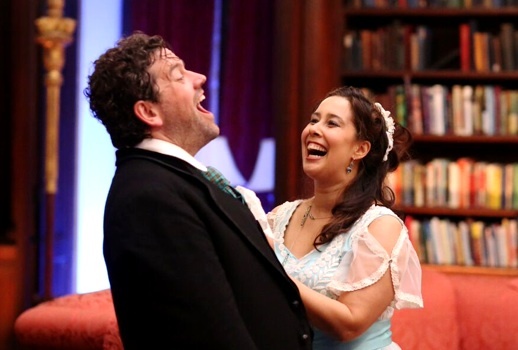 Isaiah Musik-Ayala’s slyly insinuating Basilio and Benjamin Bloomfield and Jessica Rose Futran as Bartolo’s less-than-faithful servants gamely entered into the spirited plan to rescue Rosina. Those familiar with other examples of 18th century opera buffa like Piccinni’s La Cecchina ossia La Buona Figliuola or Cimarosa’s Il Matrimonio Segreto would feel at home in Paisiello’s sprightly but undemanding score which premiered in 1782 during his long stay in St. Petersburg. Even without the challenge of Rossini’s more brilliant version, it seems unlikely that this charming if faded Barbiere would have retained its place in the repertoire. Much of the music, like Basilio’s calumny aria, is pleasant if unmemorable, and Rosina’s plaintive “Giusto ciel, che conoscete” which concludes the second act fails to rise to the heights of Paisiello’s best known aria, “Il mio ben quando verra” from Nina ossia la pazza per Amore. And yet occasionally one gets glimpses of why this Barbiere was once so popular—Bartolo’s “Veramente ho torto” brilliantly bullies Rosina with yards of dyspeptic patter. In the score’s highlight, the marvelous third-act finale magically transforms the stunned “buona sera” quintet into a wonderfully scampering quartet. And Paisiello briefly touches the sublime in a near-Mozartian duet for Rosina and Almaviva at the beginning of the final number; one is reminded more than once of Konstanze and Belmonte from Die Entführung aus dem Serail, which also premiered in 1782. Only occasionally challenged by the awkward logistics of the library setting, Geoffrey McDonald, who in April conducted R. B. Schlather’s disturbing Orlando, led Barbiere with a firm, loving hand. His substitution of a guitar for a keyboard for the recitatives worked surprisingly well. While it was reassuring to glance over and note McDonald conducting with a blissful smile on his face, one does hope that he will soon get the opportunity to lead a production where his orchestra includes more than just two violins. Although I’ve enjoyed Paisiello’s score for years coming to it in high school via the entrancing 1959 Renato Fasano recording with Graziella Sciutti, Nicola Monti, Rolando Panerai and Renato Capecchi which I first heard via a set of Everest LPs and which remains available on CD, On Site’s production was my first opportunity to experience it live. Unfortunately the four-performance run has been completely sold out for weeks. So it’s not too soon to make plans to catch the next installment of the company’s ambitious three-year Beaumarchais project: in 2016 it will produce the North American premiere of Marcos Portugal’s long-forgotten 1800 version of Le Nozze di Figaro, followed in 2017 by the US premiere of Darius Milhaud’s La Mère Coupable. 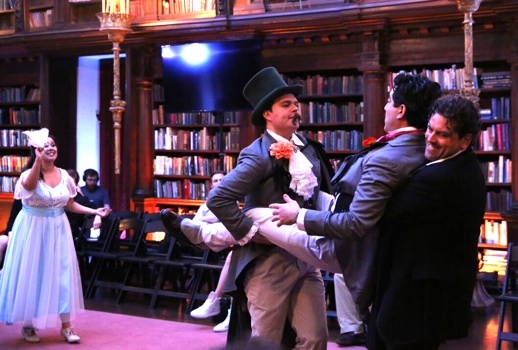 Those unable to catch On Site’s Barbiere can rejoice that—remarkably–the Paisiello will soon be mounted again in New York City: in August by dell’Arte Opera Ensemble as part of its Figaro project.